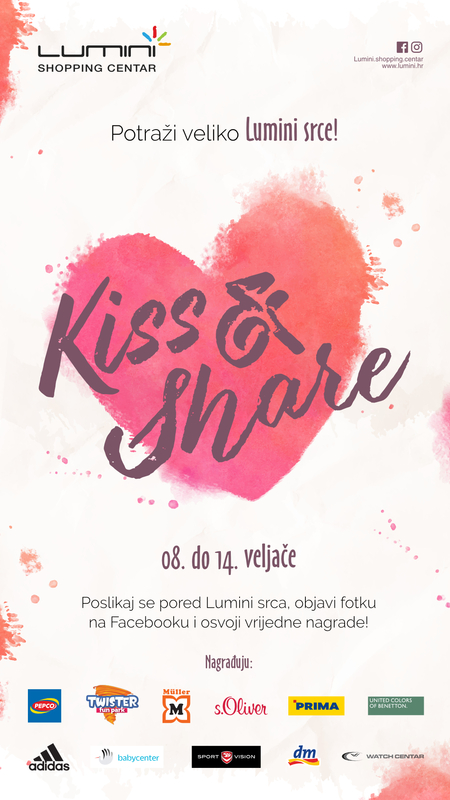 KISS & SHARE – For this Valentine’s Day with kiss you can also get really valuable prizes! Wondering how? Take part in the big Lumini Valentine’s Day PHOTO Contest. Share a photo on the Facebook page of the Lumini center below the post of the contest – here! In the commentary of your post, tag the dear ones you love! The competition runs from 08 to 14 February, and we will select the winners through www.random.org and publish them on February 15. You can find the rules of the competition and the list of all prizes – here! Win rewards by playroom Twister, Müller, Adidas, Pepco, Watch Center, dm, United Colors of Benetton, Sport Vision, Baby Center, s.Oliver and Prima. You can win valuable gift certificates, toys, silver jewelery, cosmetic kits, gifts packs, T-shirts and more! Play with us, wish you a Happy Valentine’s Day and win the super prizes!